Melanie Clegg, also known as Madame Guillotine, is a successful novelist, avid blogger, and a self-proclaimed gin-swilling Victorian prostitute. She is also the author of The Secret Diary of a Princess , an exciting new novel about Marie Antoinette's early, carefree years in Austria. The Secret Diary of a Princess offers Antoinette-enthusiasts a fresh pair of spectacles from which to gaze at her, painting the portrait of a fun, charming, light-hearted girl. Ms. Clegg was born in Forres, Scotland on October 10th (the day French physician Joseph-Ignace Guillotin, stood before the National Assembly and declared he could invent an efficient, humane killing machine. Hence, her moniker, Madame Guillotine). She has an Art History degree from the University of Nottingham. LMB: I would be remiss if I didn’t start this interview off by mentioning the number of things we have in common. We are both writers, middle-class housewives, fanatical Francophiles, devotees of Marie Antoinette. And we both have pink hair. Do you think it was by accident or design that we bumped into each other on the World Wide Web? MC: Haha! I think it was all part of the Supreme Being's great plan - cosmic forces were definitely at work to bring us together! Pink haired bloggers unite! LMB: To be fair, there are also a few things we do not share in common. Although I have been known to don a Marie Antoinette costume (to frightening effect) I understand you prefer to flounce around in the garb of a Victorian prostitute. What’s that about? MC: Ooh, well I do like to dress up as Marie Antoinette but yes, I definitely have a preference for a bit of Victorian Prostitute re-enactment which involves a spot of dressing up, hanging around alleyways and drinking gin. I've been fascinated by Jack the Ripper and his time since I was a very, very little girl and this turned into a full blown obsession as an adult. I would definitely call myself a Ripperologist now. Anyway, yes. MC: We do indeed use that phrase. Nuts and bolts, I mean NOT twigs and berries. This reminds me of a Twitter conversation I had last week with an American follower who seemed to be expressing surprise that we have washing machines here in the UK and no longer beat our washing with rocks in streams. LMB: Seriously? That's hilarious. One good story deserves another. When I was in Scotland a few years ago on the 4th of July, I noticed that the guide at Mellerstain House was wearing an American flag pin. I thanked him. He smiled and said, "I do so love you Colonials." Back to our interview, what is a good British girl like you doing being obsessed with a FRENCH queen? MC: Haha, well, I posted about this recently but it all started when I was about four or five years old and I saw the Blue Peter (British children's programme of a rather staid middle class but informative nature) special about Marie Antoinette at Versailles. I was HOOKED. From that time on I spent most of the time hanging about in the garden, picking roses and pretending to be her! LMB: What is about Marie Antoinette that captures your interest and loyalty? MC: Oh so many things. I love her levity, her enjoyment of life, her appreciation for charming and beautiful things, her honesty, her loyalty, her warm heart. I feel that she was one of those very shy people who get labelled as 'haughty' or 'up themselves' and that makes me sympathise with her a great deal. I also find her loyalty and love for her family immensely inspiring. LMB: Marie Antoinette is still a polarizing figure. People either love her or hate her. Those of us who love her are often accused of being too sentimental or romantic. What do you say to that? MC: I say pooh to it. Oh yes, I get criticised quite a lot for liking her so much - people seem to think that if you sympathise with Marie Antoinette then you must be some sort of peasant hating, cold hearted enemy of democracy. It's utter nonsense. LMB: Agreed. Though many have argued that Marie Antoinette’s careless actions greased the wheels that allowed the Revolution to move at a brisker clip, do you agree? MC: I don't think it was quite so extreme as that, no. I believe that the wheels of the revolution were greased at a much earlier date and that the monarchy was already doomed by the time she arrived in France in 1770. If Louis had been another Louis XIV then maybe things could have turned out differently but I don't think they can be held personally responsible for what happened in France. LMB: What do you think was Marie Antoinette’s greatest folly? MC: Her loyalty was one of her greatest assets and also one of her biggest failings - her blind devotion to her friends and their interests was not entirely advisable, I think. LMB: Your novel is a fictionalized account of her early life. What is about that time in her life that interests you? MC: I liked the fact that it has been so rarely treated properly by other writers and yet gives so many clues about the woman that she was to eventually become. There is a tendency to portray Marie Antoinette as a gauche little princess who was totally overawed by the splendour of Versailles and the French court, but that just wasn't the case as after all her mother was one of the most powerful rulers in the world and she had grown up in the Hofburg and Schonnbrunn in Vienna, which aren't exactly rustic shacks, even in comparison to Versailles! I was also interested in her family and how she got on with her sisters and brothers. LMB: Did you travel to any of her childhood homes? If so, what did you learn about her while you were there? MC: I didn't alas. This is a bit embarrassing actually, but I didn't make it to Vienna while I was writing this book although I read a LOT while I was working on it. The impression I got from my readings was that life at the Habspurg court could be just as splendid as that at Versailles but there was also a more informal, cozy family feel. MC: Oh lots! 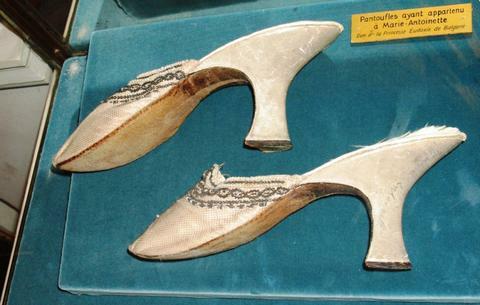 I love seeing her shoes at the Carnavalet - there's something so personal about someone's shoes isn't there? Oh and her fabulous travelling case in the Louvre - so beautifully put together and also useful! LMB: As you know, I am fascinated by the power of Serendipity because I have experienced it many times while plotting and writing my novels. Did you have anything odd happen while you were writing this book – anything that made you wonder if a higher power was nudging you along the path? LMB: What sort of research did you conduct in preparation for writing The Secret Diary of a Princess ? MC: Oh SO MUCH reading! Loads of books about Marie Antoinette, Austria, the Hapsburgs, Versailles, fashion, food, everything of that time. It was fascinating and also gruelling! LMB: Did you learn anything about Marie Antoinette that surprised you or upset your beliefs? What? MC: Not at all - quite the reverse in fact, I felt like I was uncovering a really lovely, vital, charming princess and ended up liking her even more than I did before! The more I learned about Marie Antoinette's childhood and family, the better I felt I understood her. 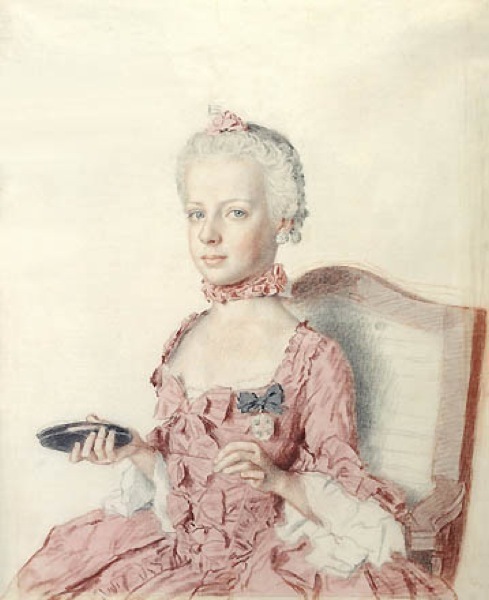 LMB: Who do you think was Marie Antoinette’s closest childhood friend? MC: Definitely her sister Maria Carolina - the two girls were inseparable until Carolina was married and sent to Naples. The sisters used to mess around during their lessons and play tricks on their mother's courtiers - to the extent that the Empress threatened to have them separated. That's the side of Marie Antoinette that intrigued me and that I wanted to evoke in my book. LMB: Who had the most influence over her early years? MC: Definitely her father. He died when she was still very young but the memory of him remained at the court and in the hearts of his widow and children forever. LMB: How was Marie Antoinette ill-prepared for life at Versailles? MC: Her mother, Maria Theresa, was in the unusual situation of having not only chosen her own husband but of having enjoyed a happy and fulfilled married life with him. The private life of the Imperial royal family was totally unlike that of the French royal family and Maria Theresa totally failed to prepare her daughter for any of this - she had no idea what it was like to marry a stranger that she did not love. Marie Antoinette and her siblings enjoyed a carefree happy childhood - the Bourbon children were much less fortunate. LMB: There has long been speculation about the cause of Louis and Antoinette’s early infertility. Some have suggested Louis suffered from phimosis or hydrocele, while others suggest Marie Antoinette was frigid. What are your thoughts on the matter? MC: I think they were just ill prepared, shy and awkward. I don't think there was anything wrong with either of them in terms of libido or health - they were just ignorant and uncertain. Poor things! LMB: Since we’ve slipped into bed between Louis and Antoinette, let’s really dish. What are your thoughts on the whole Axel Fersen matter? 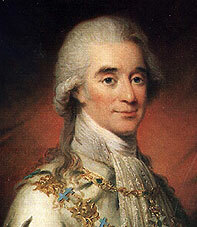 Did Marie Antoinette have an affair with the dashing Swedish count? MC: Hahaha! The thing about Marie Antoinette is that she really wanted people to think that she was a great beauty and she also badly wanted to experience romance and love. She wanted to be a heroine. There's nothing wrong with that all - she loved Louis deeply but I doubt that she was ever 'in' love with him and so even thoughdevoted to her, he couldn't really give her the great romance she thought she craved (of course, in retrospect, the mutual devotion of Louis and Antoinette at the end IS a great romance). I think that Axel de Fersen filled that craving to an extent but that nothing physical happened between them. I feel that their relationship was akin to those at the old Medieval Courts of Love - a knight and his lady. Nothing more than that. LMB: Well said. I agree completely. In your research, did you find anything that would indicate Marie Antoinette was unfaithful to Louis XVI? MC: No, not at all. It's been suggested of course, but I feel that it would have been out of character for her to commit adultery. LMB: If someone pressed the rusty tip of a bayonet to your throat and demanded you choose an allegiance, would you proclaim yourself Royalist or Revolutionary? And why? MC: Oh, this is hard. Royalist, I think. I love Lucile Desmoulins, Danton, Madame Roland, Camille, Héraut de Séchelles and the others BUT the brutality of the times really horrifies me and so my sympathy is totally with the royalists. LMB: Fair warning, I am about to ask a few oddball questions. For years I wondered if I was the reincarnation of Marie Antoinette. I have since abandoned that belief (in favor of the notion that I was probably a member of her court of humble origins). Do you believe in reincarnation? MC: Oh that's interesting! I used to believe very strongly in reincarnation but am not sure nowadays. I love the idea of it but am not sure about the actual mechanics of it! LMB: So, who do you think you were? MC: I think I was Lucile Desmoulins, Émilie de St Amaranthe or similar. Or maybe a Victorian Prostitute? One of my grandmother's friends was absolutely CONVINCED that she was reincarnated from Mary, Queen of Scots and I remember her getting very, very angry with me as a little girl when I visited because I have the same hair and eyes (really it is uncanny!) as Poor Old Queen Mary. I am about a foot shorter though, so that's okay. LMB: Let's hope you do not end your days in the same fashion that poor Mary ended hers. LMB: If you could trade lives for one week with one person from Marie Antoinette’s coterie, who would it be? MC: Rose Bertin maybe? Or Madame Vigée Lebrun? Someone with talent and an appreciation for lovely things. I bet Mademoiselle Bertin had some amazing clothes and, wow, Vigée Lebrun has works in the Louvre! LMB: If you woke up tomorrow and suddenly found yourself strolling around the pond at le hameau, Marie Antoinette, by your side, what would you say to her? LMB: What is your favorite scene in The Secret Life of a Princess ? LMB: What do you hope readers take away from The Secret Life of a Princess ? LMB: What are you working on now? MC: I am currently working on my book based on The Buccaneers and then I will be writing a book about Isabella de' Medici and one about Jack the Ripper! LMB: A writer's life is typically one of isolation. Do you belong to any writer's organizations? MC: I am a member of the Arvon Foundation and also the Romantic Novelists Association. LMB: Do you have any advice for would-be novelists? MC: Ooh, read lots, never give up and remember that even writing a little bit every day is better than never writing anything at all. LMB: What do you like to snack on while you are writing? What's your brain candy? LMB: Merci beaucoup et bonne chance! MC: Merci beaucoup et bonne chance aussi, belle madame. Another fantastic interview. I really enjoy your manner of questioning. I hope you will be posting more interviews soon. What a funny interview. I loved it. You really make me laugh. Hey! An Australian bloke here! Enjoyed your interview very much. Will take on the advice to write at least a little every day. Thanks.